My interest in the world of Tékumel began after reading The Man of Gold, and Flamesong. A friend who had also read the books purchased the RPG, and our gaming group played a couple of games that I found quite enjoyable. Unfortunately, we found the rules rather kludgy, and the world was perhaps too alien to the other players, so it never became a mainstay for our group. One of the aspects of Tékumel that I liked the best was that the alien races were like nothing that I had encountered in RPGs at the time. I was intrigued by the 2x4 limb arrangement of many of the creatures, and in particular with the aboriginal creatures of Tékumel, the Ssú and the Hlüss. I think I was only vaguely aware of Tékumel miniatures back when I was actively gaming, and it is only recently that I've been able to buy some of these miniatures. I'm not sure about the exact history of these sculpts, but the Legions of the Petal Throne line was originally produced by Old Guard before being bought up by Ral Partha, and eventually transitioning to PHD Games (and from there to oblivion). The image below shows a Gray Ssú, and two Black Ssú. All of the miniatures come with the front pair of legs cast as a separate piece. The Gray Ssú is a fairly rough sculpt, and does not have the tattered appearance or oval mouth that are attributed to the Ssú. The Black Ssú are larger, and much better sculpted. Different versions of the front pair of legs allow the figure to be posed either with raised legs, or lowered legs. Next is a Hlüss miniature fitted together to show how the basic miniature looks. It is really crude, with a thick neck and narrow head that only vaguely resembles the picture of the creature in the books. It will definitely take a bit of work to make this particular figure look good. In trying to find out how well the miniatures work for 1/72 scale, I found some discrepancy in the size given for the Ssú between different Tékumel sourcebooks. Table 1. Height when on four legs. When I use the Swords & Glory heights, the miniatures scale out as 1/72. If I were to use the heights from The Tékumel Bestiary, the creatures would be too big. 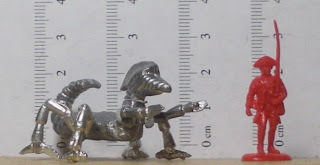 However, the heights listed in The Tékumel Bestiary, are in scale with respect to 28mm figures. I kind of wonder if this was a case of retcon to make the size of the Ssú miniatures consistent with that of the human miniatures. In any event, I'm obviously going to go with the original Swords & Glory values for my Ssú. Yahoo group. It's not been very active lately but it's where I've been posting photos of my own 3D printed efforts. Jeff Berry is probably the leading authority on the subject - I think he sculpted your Hlüss. Already a member. I've seen your 3D models and am green with envy. Love the Serudla in particular. Thanks. Let me know if you want any - I've got extra and can always make more.